Your job is literally killing you! ווער איז דער באבאווער רבי און ווער זענען די באבאווער חסידים? 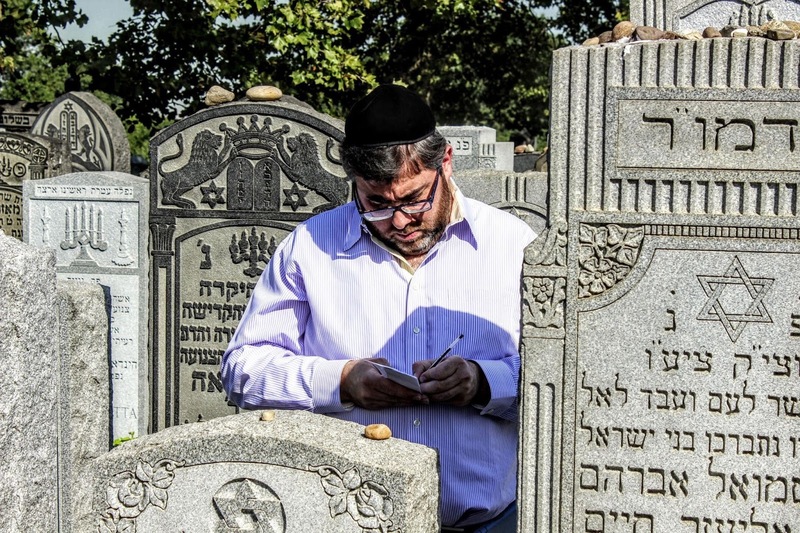 TJW: The tricks of the "trade shuls"
Young shliach Mendel Hurwitz speaks about growing up Jewish. The fact that this light unto the nations is emanating from Hungary, and is the product of the hard work of a Chossid מיוצאי אונגארן, only adds to the nachas. At least for me. We wish the Hurwitzes much continued nachas from Mendel און אלע אנדערע קינדער. On a technical note, if you're using the IE browser and are prompted to either see all or only secure content, click "show all content." That will bring the videos to your screen. With Google Chrome it does not seem to appear, hence the need for the links. פארוואס באשליסט א סאטמארער צו ווערן א ציוניסט? Click Here to listen to the Rebbe Reb Aron of Satmar's pesichas haZman speech. At least the part that we want to hear. Funny how only he was allowed to be mechallel yomtov to daven at Rodney Street. Not him, of course, but his people. They were allowed to fight for עצים ואבנים in the treyfene Amerikeh, but Jews in the Holy Land, can't insist on davening anywhere, lest they invoke the wrath of those who hate us. And the near justification of the killings - it's just plain sickening. We're not discussing the permissibility of going up to the הר הבית, and in a way neither is he. This seems to be a personal vendetta and agenda that he has, to go after the Religious Zionists and all that they believe in at every opportunity. To discredit their theology and to make it א תאוה ווי אלע תאוות, with no basis in anything Jewish, as were his words in the not-so-distant past. But his motives are all very pure, which is why he's in secular courts all these years against his brother Zalman, right? 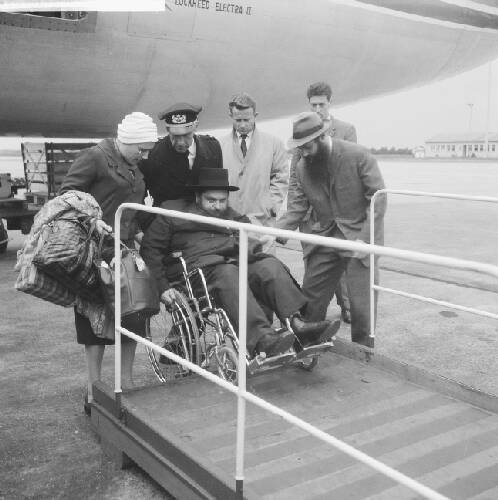 "Rebbe of my past, Pillar of my forever"
(Arrival of Rabbi Uriel Zimmer to Schipol) I do not know what the conference in Schiphol, Holland in 1961 was for or about. Maybe UN work? 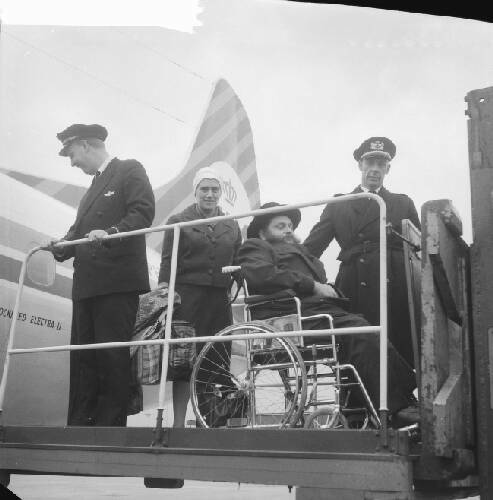 RUZ was handicapped and used a wheelchair. 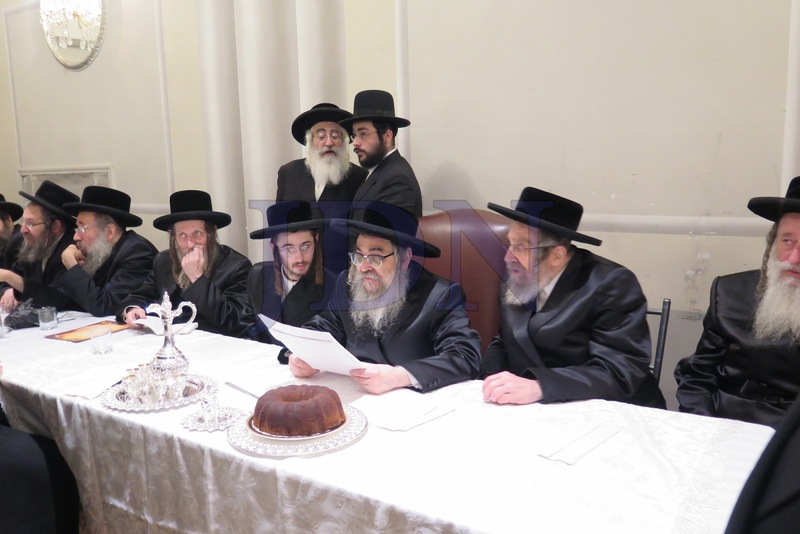 Seen also, with the white tichel, is his Rebbetzin, zol gezunt zein, who is currently was later the wife of Reb Tovia Weisz, currently of the Eda HaCharedis. 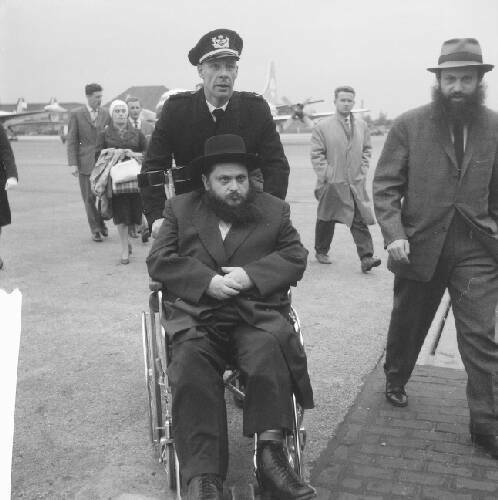 Also who is the other Hasidic looking Jew walking alongside him? If you do have any information to share, please do! Frankfurter edicated the Sukkos issue of Ami magazine to Reb Burechel Munkatcher. The son Reb Moshe Leib opened himself up as never before, saying that is father was a hero, just as much as Reb Michoel Ber Weissmandl, except he wasn't recognized. 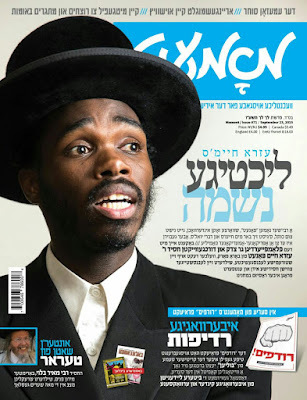 He claims his father was not dumped by Munkacher Chasidim after the war, he just was not ready to be stuck with a local chasidus - Klal yisroel and its problems were his life now. It's a very interesting piece. 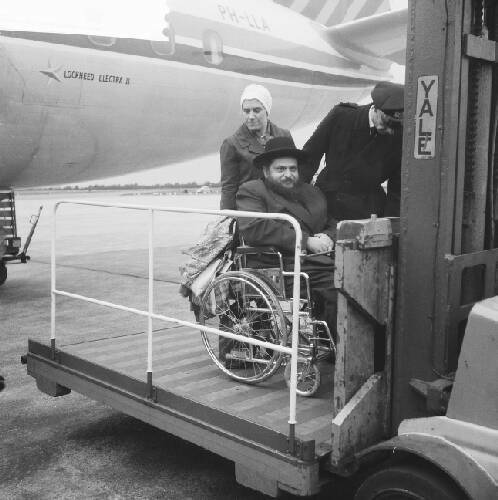 Reb Burechel busied himself finding a answer for the Shoah. 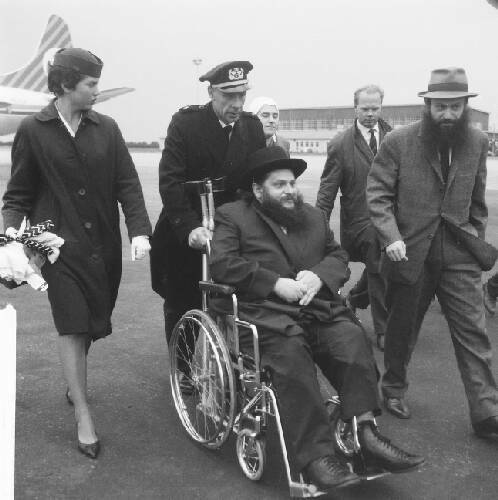 Reb Moshe lieb is saying that 2 rebbes were trying to answer the Shoah The Satmar Rebbe and the Lubavitcher Rebbe. 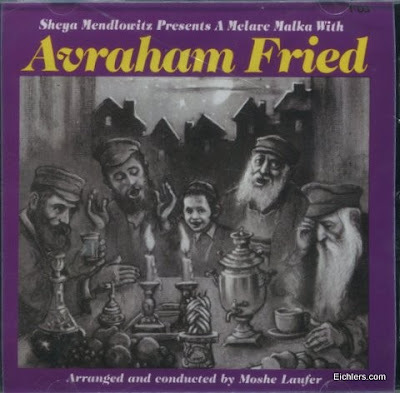 I don't know which Lubavitcher Rebbe, maybe the Rebbe Rayatz in הקריאה והקדושה. Reb Burechel was arguing that it's dangerous not to get a answer. It can happen again. היל"ת. The Shoah was a message; if we didn't get the message this time it'll happen again. 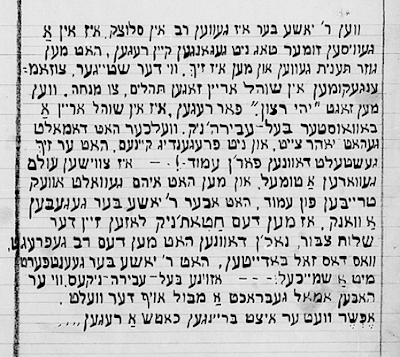 ר"ל. Reb Moshe Leib is saying that Reb Shmuel Duved Ungar zt"l, the Nitra Ruv, wrote a letter to his father with the title "צדיק יסוד עולם." 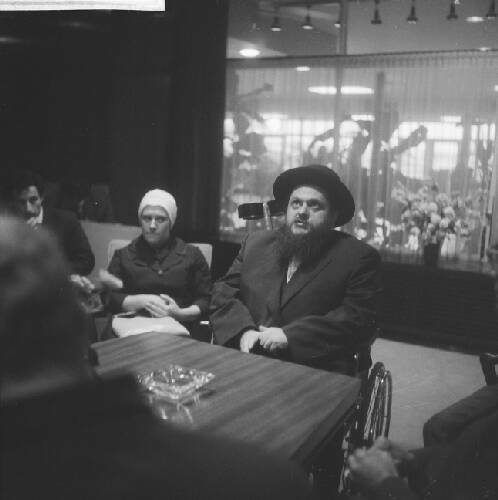 At the time Reb Burechel was 30 years old. The Munkatcher asked Reb Shmuel Duved's son, Reb shulem moshe, why did his father use such lofty titles when addressing him? He answered: Noach is called tzadik for saving Gentiles, your father saved thousands of Jews, that's a whole universe. 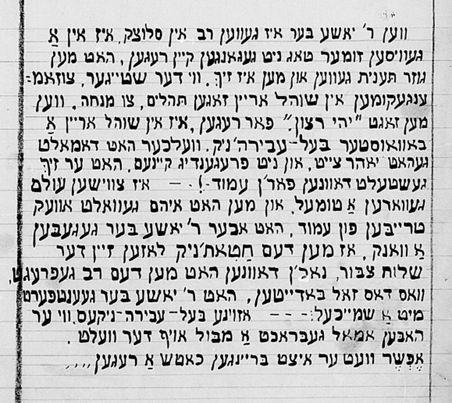 The letter is printed in a pamphlet that Reb Burechel printed for his candidacy for the Tel Aviv Rabbinate. So, by "sense of humor" I mean that he doesn't take himself seriously enough. He can do such an interview and not worry about what the world will say. I was as surprised as the next guy when I saw the article. I guess anybody can be rehabilitated these days. מה שלא יעשה השכל יעשה הזמן, as the saying goes. The problem is that - no disrespect intended - the Munkatcher was the one who had a yad in ostracizing his father... Not so the much the Dinover. To be fair the old timers made sure they were fed lies about their father. So it's not that Ami just discovered Reb Burechel and went looking for his next of kin. If you get what I'm saying. Also, Frankfurter most likely, and I'm being very generous here, knows what went on when he was a kid, he knows what they did in Munkatch, he's not someone who grew up outside that circle... They're basically enabling this revision of history that every kid in Boro Park knew about. 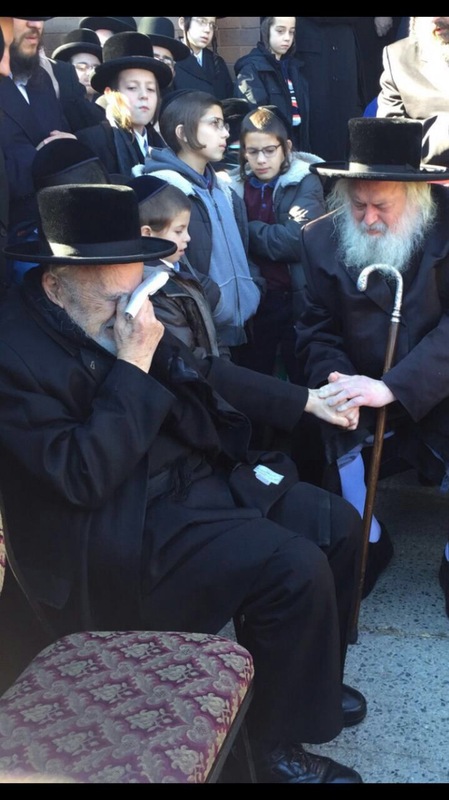 At least twice a year on Shabbos morning we'd hear that he passed away, and then we'd laugh/cry about the history and how Munkatch skipped a generation. So why now? Beats me. Maybe they've been reading stories and testimony online. Maybe his grandkids asked too many questions? Agav, I like how every picture featured in the article was previously on this blog. Not saying anything, just saying.